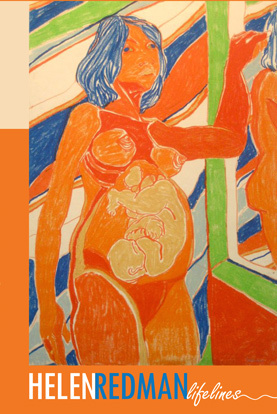 This fully illustrated catalogue provides a core sample of Redman's remarkable explorations of motherhood. Including essays by Curator Alessandra Moctezuma, art historian Amy Galpin, Ph.D. and Malia Serrano, M.A. Short memoirs by Redman and her family also give perspective to the art that has surrounded them throughout their lives. "The rawness of age and the complexity of the aging process as explored by Redman in her deeply personal works is too often absent in the public sphere. This distinctive artistic vision honed by Redman over many decades began with work about creation—the birth of her children—and another form of human transformation, pregnancy." - Amy Galpin, Ph.D. is the Curator of the Cornell Fine Arts Museum, Rollins College and the former Associate Curator, Art of the Americas, at the San Diego Museum of Art. Many of the original paintings and drawings of the artwork shown on this site are for sale, prices on request. Signed limited-edition 11" x 17" color prints sell for $55/each. Be sure to specify the title of the work(s) you wish to purchase and the artist will inform you about availability. To purchase directly from the artist, e-mail: redcrone@aol.com. Roland Reiss, Chair Department of Art, Claremont Graduate University, and Margo Espenlaub, Ph.D., Associate Director for Student Development, Women's College of the University of Denver have contributed essays from a fine arts and a women's studies perspective. "A biographer of beauty who recognizes the luminous in female aging, Redman enacts the transformative elements of crone work: acting out and unmasking new identities while confronting the silence and invisibility that encompass women in the inevitable process of our aging." -- Margo Espenlaub, Ph.D., from "Acting Our Age: The Art of Helen Redman's Crone Work"
Ultimately Helen Redman’s self portraits are everywoman and everyman. These images speak to us of meaning, value and understanding in life. Birthing The Crone tells much about the journey through time shared by all of us. It is a guide to personal awareness exemplified in a creative response to life." -- Roland Reiss, from "The Human Dimensions of Helen Redman's Art"
The more we are told to fight aging and remove all traces of it from our lives, the more it becomes necessary to see the beauty of old. I hope this catalogue will help you to do that and inspire your own creativity. Consider it as a gift -- to yourself, your family and your friends.